Since February 16th I have been transcribing letters, audio, and other documents and posting some of these transcriptions every Monday morning. The below letter was sent not long after my maternal grandparents, Martin and Myrtle (Van Every) Deutsch were married on December 31, 1936. It was sent to my great grandparents, Samuel and Helen (Lichtmann) Deutsch. 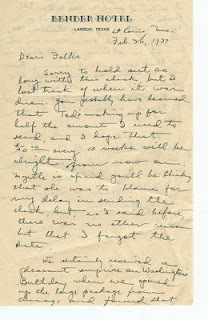 And my grandfather wrote it - Most of the letters I have were written by my grandmother. Sorry to hold out so long with this check, but I lost track of when it was due. You probably have learned that Ted’s making up for half the amount I used to send, and I hope that $50 every 10 weeks will be alright from now on. Myrtle is afraid you’ll be thinking that she was to blame for my delay in sending the check, but, as I said before, there was no other reason but that I forgot the date. We certainly received a pleasant surprise on Washington’s Birthday when we opened up the large package from Chicago and found that it contained such a nice radio. I’ve placed it in a nice corner of our home with a big easy chair on the side of it and from now on, when ever I’m in St. Louis, you’ll find me in that corner each evening. There was no letter or card with the radio and we’re not exactly certain who sent it, but we want to thank everyone who had a hand in it. We might be around in a short while and will thank you in person – and we can tell you of our trip to Mexico. Near the top of the second page you can see where my grandfather scratched out the word 'nice'. I think he realized he had just used that adjective in the preceding sentence. It's interesting to see the word was just as overused back in the 1930s as it is today, and it's also pleasing to see my grandfather concerned about his word choice. The 'dateline' says they're home in St. Louis, MO, but the hotel stationery is from Laredo, Texas. The stationery probably indicates Laredo was a stop on their honeymoon in Mexico. The signature surprised me. My grandmother died in 1951, and my grandfather remarried in 1965. His second wife was named Marjorie. 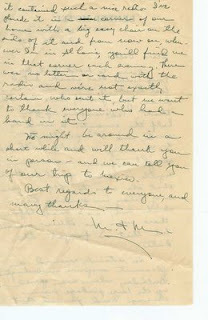 Almost every letter or greeting card I received from them was signed M&M.